Kate was admitted to Texas Children's last night. She spiked a fever yesterday evening which resulted in a mandatory visit to the hospital. We waited in the ER, thankfully in a private room, for a few hours before a room was available on the heme/onc floor. We are sad that there weren't any beds on the BMT floor so we could see all of our favorite nurses. Kate had fever throughout the night but as of now is fever free. As long as her blood cultures come back negative, we should be home tomorrow. For now she is getting IV antibiotics around the clock and adjusting back to the hospital life. Alex and I knew that post transplant hospitalization was inevitable as 90% of BMT patients end up readmitted due to fever. We are just praying this is a quick stay! Kate is loving all of the attention from everyone on the 9th floor. She is such a social butterfly and is eating up the fact that se can actually see people right now! At least she is happy! Hope Kate is continuing to be fever free and you get back home soon! I'm so sorry Kate ended up back in the hospital again and I hope it's a short stay. I have been following Kate's journey since she was first admitted for her BMT. I stumbled across your blog when doing research about pediatric BMT's. 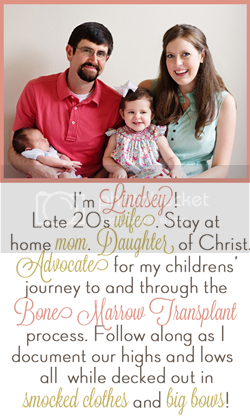 My own daughter will be headed for transplant in the coming weeks for Leukemia. Reading Kate's story has given me some hope that Olivia will come out the other side of this experience very much herself. Thanks for sharing your story. Blessings and prayers to you and your family. Praying for your sweet girl! Pear Tree Greetings: Holiday Card Giveaway! Things I Don't Want to Forget!